As mentioned previously, doing a best-of prompts quite a bit of reflection, including the fact metal has been without a definitive “hit” song in quite some time. Certainly there are those who will vouch for Avenged Sevenfold, Disturbed or Five Finger Death Punch, but they aren’t readily accepted by the true scene die-hards. Metallica would be next up and while they achieved rather monstrous sales figures for last year’s Hardwired…to Self-Destruct, the album doesn’t have a hit on the level of “Enter Sandman.” Is this a bad thing? We’re not sure, especially since metal has been more album-oriented than ever, with bands not hesitating to write long, monolithic jams. Expect that to continue. As for the below, there’s a healthy mix between heavy and not-so-heavy, which to these aging ears, is the right formula. Surely there’s stuff from the below that this scribe wouldn’t have been keen on 20 years ago, but that’s all a part of the development process. Staying the same is boring anyway. Lee Douglas’s shining moment. Anathema’s, too. A heathen, pagan, cheery stomp-fest. Check out the joyous background cheers after the first chorus. Kristina Esfandiari has no trouble bearing her soul. We should be thankful for that. The doom anthem of 2017? Too bad they didn’t put “doom” in the title like they did for two other songs on the album. 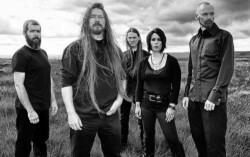 What happens when a now-experimental Finnish doom band toys with female vocals. Lushness all the way. When Bobby Blitz demands you stand attention, you best recognize. The man sure knows how to spit at his age. Anna Murphy and her hurdy-gurdy have no rival. 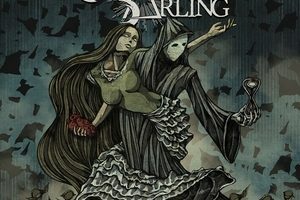 Now she has the platform to take over the folk metal world. Throw on your leather jacket, light up a cigarette and let’s get down. Drinks optional. Justifiably loved by the metal scene, Emma Ruth Rundle should be on the same level as Chelsea Wolfe. 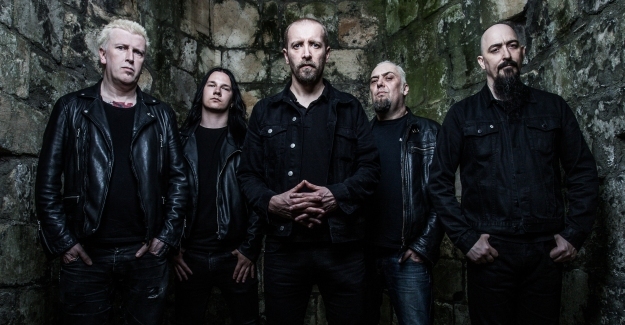 Paradise Lost can do no wrong…except leaving this off Medusa and making it a bonus track. Best newcomer: Old Night. The Croatians aren’t going to be unknowns for very long. Their style of doom is timeless, but more importantly, their songs are would-be classics, pure and hit the doom bulls-eye. Biggest Surprise: Morbid Angel’s return to death metal glory. 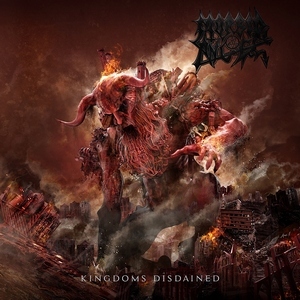 Released a bit too late in the year for full digestion, Morbid Angel’s Kingdoms Disdained is the molten lava answer to Formulas Fatal to the Flesh. It just about erases the bad dream that was Illud Divinum Insanus. Almost. Biggest Disappointment: The death of Martin Eric Ain. The Celtic Frost bassist tragically passed away in October, leaving behind a legacy as one of extreme metal’s true pioneers. His partnership with Tom G. Warrior forever cemented Celtic Frost as innovators, inspiring legions. 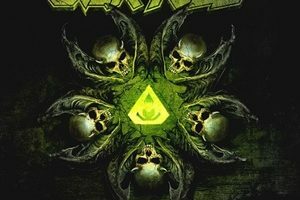 Album cover: Morbid Angel – Kingdoms Disdained. Another Morbid Angel entry, this time for Kingdoms Disdained’s cover art, depicting a great bash smashing the entire universe. Seems like now is a good time for a reboot, eh? Click here for a larger image. Best concert: Sabaton – April 28 – The Agora, Cleveland, OH. This was the year that Sabaton finally conquered North America, with the Swedes playing to packed houses across the country. In front of a sold-out crowd in Cleveland, the battle-metal-men were, for lack of a better term, awe-inspiring.